What were the TSR2 and Chevaline? Why was one cancelled and the other developed? This is a very British story from more than 50 years ago. It is a story of remarkable technological ambition from a different country than is seen today. It was an era in which the country adjusted to decolonisation and a dangerous nuclear arms race close to home. The maturing Cold War engineers of the British aviation industry sought to outdo the nationally-celebrated and frankly propagandised achievements of their fathers’ generation. Meanwhile, black and white post-war austerity was being replaced by the colour and rhythms of the swinging sixties. For everyone, engineers or otherwise, the country was changing fast. Britain and the Bomb tells one of the great British stories from the Cold War – the transition of the nuclear deterrent from the Royal Air Force to the Royal Navy. The author draws upon insights from the laboratories, the military, popular culture and from politicians to make sense of a complex time and to challenge some widely-held perceptions that Britain in the 1960s lost her technical ambition and ability. Rather than industrial chaos and short-termist leadership, there is instead a story of shrewd, but pragmatic, moves in the chess game that was the Cold War. The author looks at how Britain saw the role of nuclear weapons, providing insights for the decisions that now lie ahead for Britain in the twenty-first century. The story pivots around a single day in April 1965. The recently-established Labour government very publicly cancelled the much-vaunted TSR2 nuclear strike bomber, causing dismay among aviation enthusiasts. The passing decades have done little to diminish the controversy and a pervasive sense of nostalgic melancholy about a lost Britain. 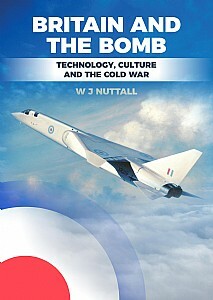 What really happened to the TSR2 and more importantly what happened in the years that followed? By taking a wider view, the merit of the 1965 decision is apparent, providing better understanding of the even bolder and more ambitious decisions that were needed into the 1970s. Those bold actions were once highly secret and are still not widely-known or understood. While Britain very publicly cancelled her strike bomber ambitions she very secretly pursued a different nuclear weapons project: the ‘Chevaline’ upgrade of the submarine-based nuclear deterrent. That engineering success deserves to be remembered. This is a fascinating book that takes us back to a time of British boffins, supersonic test pilots, mods, rockers and Cold War spies. This will be of especial appeal to anyone interested in modern history, the Cold War and nuclear technology policy.